DBUS-reactor, or AsusOSD must die! How to write a tiny python app (less than 50 lines) that reacts to events on the DBUS buses. For example, displaying a notification when you press one of your keyboards' special keys. The eee is small. It has very little storage. So, why should I use dozens of MB on a word processor? Because I get word documents in the mail every once in a while. # Create a client class which will make HTTP requests with Google Docs server. # Authenticate using your Google Docs email address and password. Try it, as long as you have firefox, a decent version of python and gdata it should open the doc you pass as first argument on google docs in firefox. Remember that you need to delete it later if you don't want it, and rename it if you want to keep it with a decent name. I am not turning it into a real app, but it's good enough for me. Put it in your path and associate it to your .doc files. A similar thing for .xls is trivial. A script that would handle both, also. Could please someone take this and make it a real app? I have been using my eee for a while already with a sort of Kubuntu in it. 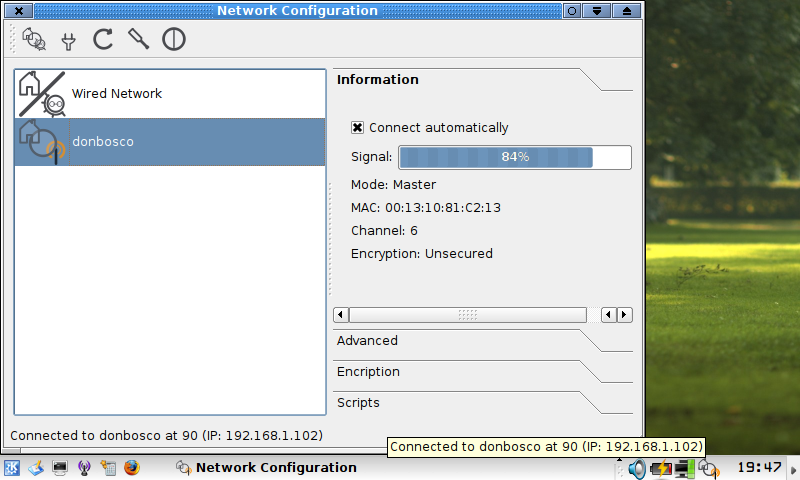 However, my favourite wireless/wired network management app is wicd, which is a Python/GTK application. Or was, since version 1.4.1 requires python-gnome2-extras. Took me about 3 hours to hack together, and works (except for wired config, the prefs dialog, static IP and scripts) but the hard work is done. If anyone wants a copy, just ask. I expect KUbuntu could use something like it? I finally got my eee PC last saturday. It's the 4G Surf in Galaxy Black . Everyone says the same thing, and so do I: you can't understand how small the thing is until you see it. And then everyone takes a picture of it sitting inside its previous notebook. So will I, 2 times. But is it the smallest notebook I ever had? Nope. 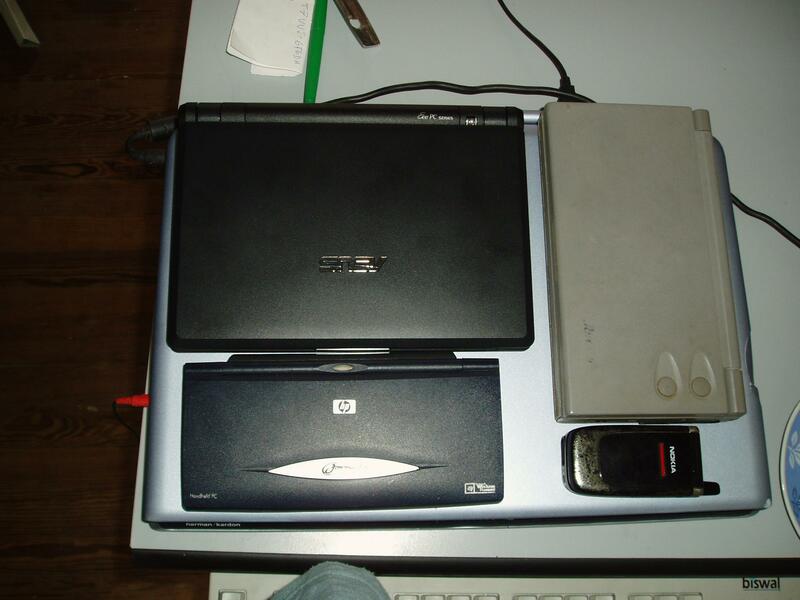 Here you can see the eee, a Toshiba Libretto and a HP Jornada 720 laying over the HP notebook, so you can get an idea of how much smaller all are. The Libretto is smaller but thicker and feels heavier. Regarding construction quality, the screen is decent, if you can live with the low resolution (I can). The keyboard is ok, even though I have large fingers  and the general construction feels good (not creaky, no flex ), but nothing remarkable. 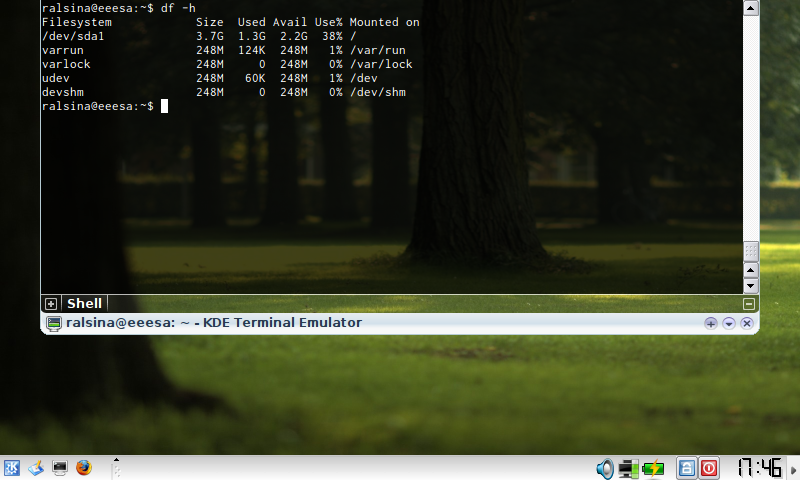 KDE 3.4 is worse than 3.5. There's no kopete? The menus are incomplete (in both the simple and advanced modes). There are a bunch of things installed but not showing. If you have only 4GB of storage, little RAM, and a slowish CPU, building from source is probably not a good idea, so I can't install that way even if I felt like it. On the other hand, everything in the eee works using xandros, and I don't know if it will on another distro. Switched to full desktop (KDE) mode. Other than that, it's still the original stuff, and I have been using it to work around the house while watching the baby, and from bars, and such. Happyness-meter: 8 out of 10 so far. Being so small, it's not supposed to flex even if it were badly built, I guess. I am still anxiously waiting for my Asus eee (still a week to go or so), and I was thinking about web browsing in the 7", 800x480 screen. Yes, you can do the usual things, go to full screen mode, whatever, but for many sites, 800 pixels is just too narrow. You can make pages fit better in a limited width by reducing the font size. A good 8pt font is probably readable on that screen, since you will be pretty close to the screen. However, that does nothing for layouts that are pixel-based, and for the size of images. However, after reading about Qt 4.4's support for webkit and widgets in QGraphicsView, I started thinking... that's doing it wrong. What you want in limited screen space is text in the usual size and the page in a smaller size. Make the font larger. Say, 12pt. Render the page in a webkit widget that's 1200x720 pixels. Put the widget in a QGraphicsScene, and reduce it 33%. The result? a 800x480 web page view that contains the whole page. Of course you should be able to change all these parameters with a single control. Is the page too wide to see in 800x480 with 8pt fonts? Then try 1000x600 with 10pt fonts, and reduce it to fit the screen. Still too wide? Then try 1200x720 and a 33% reduction. The scrollbars will look squashed, I expect. Probably checkboxes and radio buttons will look funky. Here, more advanced wizardry is needed. I got my Asus eee! Ok, I wanted the 4G, not the surf, but my mother in law is bringing it as a favour and I have no use for the webcam anyway, so the only difference is the soldered RAM, which I was not planning to upgrade anyway. and some bare white box with a nice Phoenix PC 3.0 BIOS. Why am I asking the red menace from the north for these items? Well, they do have one thing in common: Linux. Another is that they are consumer boxes, not servers. For many years, one of the huge advantages windows had was that it came preloaded with most PCs. This enabled people to turn a blind eye to windows installation and configuration since it was done by Someone Else (TM). Since getting Linux has become much easier in the last 10 years  this has been very frustrating. Imagine you had something you gave away for free, but people kept using something more expensive because they had to pay for it anyway! That itches. If Linux was not chosen because it was inferior for the task at hand, that's one thing, but not even being able to be tested because the other product was bundled and paid for? Annoying. Of course on servers this worked differently. The OS was not the expensive part, and was preloaded less often. Corporations have prearranged licensing terms, and adding things to the mix is simpler. 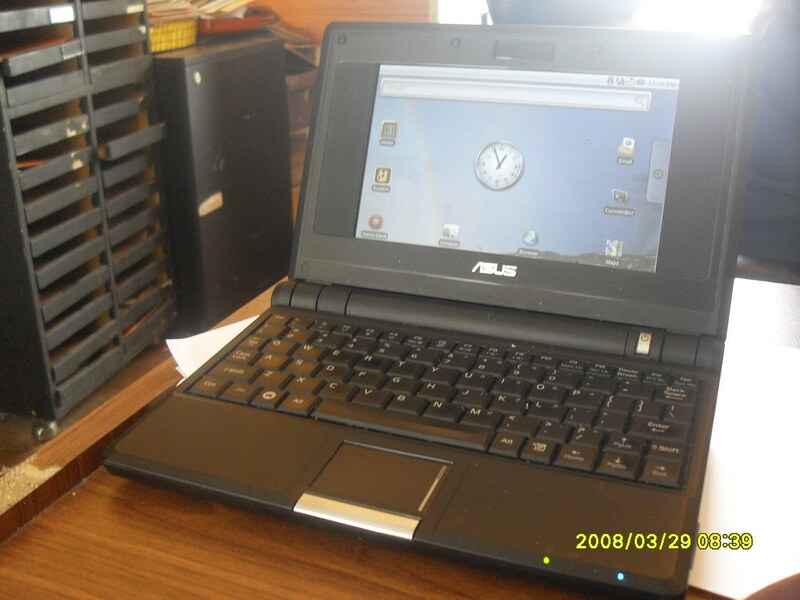 Asus eee: A cheap subnotebook with Linux and KDE preloaded. Everex gPC: A cheap Desktop with Linux and Enlightenment(!?) preloaded. Phoenix PC 3.0 BIOS: an embedded hypervisor and Linux OS. System and network admins. Really. I would love to have a cheap notebook I won't hesitate bringing to a roof, a bar, the beach, whatever. It would live in my bag. My current notebook? Besides weighting 8 pounds, it's expensive and large. All I need are webpages email and SSH sessions! Basic users and old people. Really, an office-like thing and a web browser? And I can use it wherever there's wifi? Neat. And so on and so forth. If Asus creates a decent dock  and a nice rdiff-backup-based backup solution (it should be at least as nice as Apple's Time Machine), this box turns into my main computer whenever I am at home, and is a useful tool on the road. I really can live with those specs. The gPC is a bit harder to grasp. First, it's even cheaper. $200 is cheap. The CPU is slowish, but there are a whole range of tasks that are not CPU bound. I really want one of those as a home server. This is the first time I can see one of these ITX boxes as actually cheap not just small (in fact this one is not small at all). A file server? More than good enough for that. And do all this while being quiet and power-efficient? Neat! And the Phoenix PC 3.0 BIOS simply would be cool because I can virtualize without jumping through any hoops. This one is still fuzzy for me, but I only found out about it today. I need time for things to grow. Why do I think these boxes mark a trend? Because they are definitely low-end products. These are meant to be made by thousands and hundreds of thousands, and make small money on each. The makers are being smart about providing as little functionality as they can and making them simple, niche, consumer products instead of monstruosly powerful Linux monsters (sorry for how ugly that sounds). Another factor is the huge growth of web apps that work well on non-IE browsers. This is making the OS irrelevant just like Netscape hoped in 1996. If the OS is invisible, Linux won. 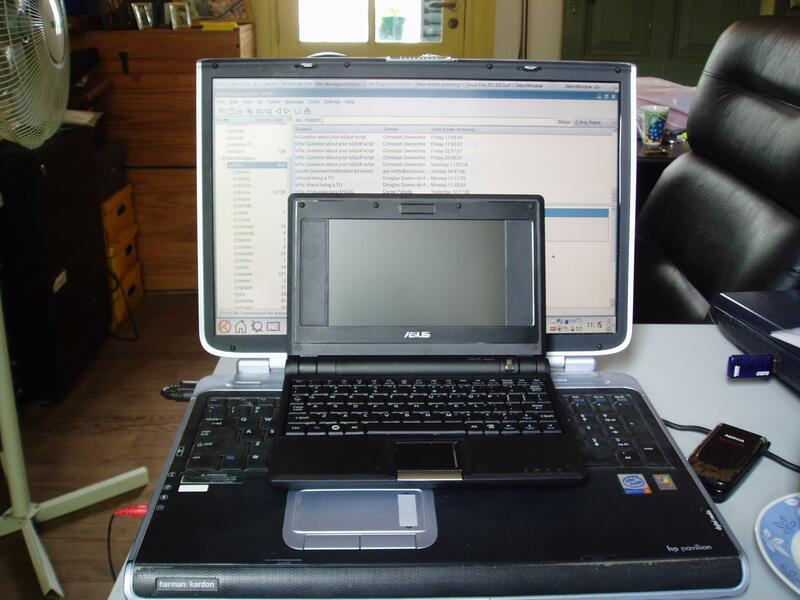 and if it has to be only one, please make it the Asus eee. PS: and if you don't do your part, the raindeer's a goner! Look, no need to create 30 floppies! You can add a driver without recompiling the kernel! You don't need to know what a Modeline is! The other one is probably games, but that's a different problem. There are whole markets where gaming is not an issue. 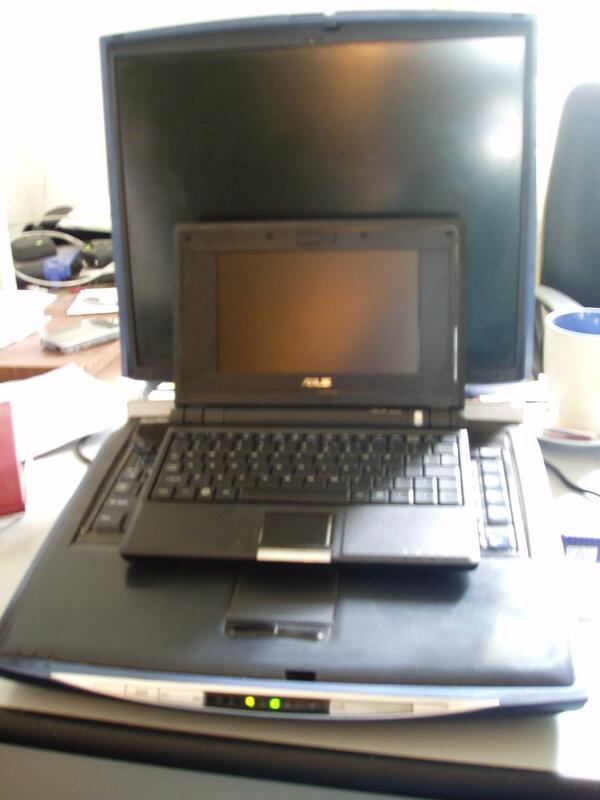 A wireless dock with place for a IDE disk or two, an optical drive, a powered USB hub, a card reader. Hardware costs? Maybe U$S 50 + disks? This is just lazy, guys! Anyone who can guess change when buying a pack of mints can guess this better than what you wrote! Sales figures since the release have been astounding, with 200 pieces snapped up in 20 minutes on Taiwan's shopping channel, ETTV Shopping - averaging an Eee PC sold every two seconds. Let's see, that would be 200 pieces in 20 minutes, 10 a minute, I guess that's one every 2 seconds plus/minus 4 seconds. Or rather, just plus 4 seconds. Read the whole Asus press release here.